Tucked in the middle of all the factories, warehouses and rendering plants in Vernon is an elementary school with more students than there are residents in the city. Most of the students who attend Vernon City Elementary are the children of workers at local businesses who travel to the city from outlying cities and nearby neighborhoods. For many of the workers, time and money are often in short supply. As parents, they find comfort knowing their child is close by in case of an emergency and that the school offers after-school programs they would be hard pressed to enroll them in closer to home. A large number of Vernon Elementary students stay on campus after the 2:30 p.m. school bell rings to take part in Woodcraft Rangers after-school program, where they spend the afternoon learning about robotics, gardening and even American Sign Language. For the last 20 years, Woodcraft Rangers – an after-school program designed for low-income neighborhoods that offer limited opportunities to its youth – has allowed kindergarten through sixth grade students at Vernon Elementary to participate in programs that would otherwise be out of their reach. Unlike many other afterschool programs that only offer homework help, arts and crafts and play time, students in Woodcraft Rangers also participate in clubs organized around specific themes, such as dance, gardening, American Sign Language and robotics. They can also participate in structured sports programs like soccer and basketball. “A lot of these kids can’t do the extra curricular activities because parents don’t have the time,” and Woodcraft Rangers fill that void, explains Principal Fabiola Hernandez. That was the case for nine-year old Dulce Lupita Camarena who wanted to take dance classes and play a sport. Her mother Guadalupe Herrera said her work schedule and the expense would have made it impossible if it were not for the after-school program. The help Herrera’s daughter gets with her homework is also a big deal for the Mexican-born mother, whose grasp of English is limited and who like many other immigrant parents has trouble reading and understanding homework assignments. Students in the program can stay at the school until 6 p.m., an added blessing to working parents who don’t have anyone to pick up or care for their child when school lets out. It’s a “big help,” says Herrera who lives in Compton and doesn’t end her workday at a local factory until 4:30 p.m. It also helps her very tight budget, saving about $100 week in added childcare costs which she must already pay for her youngest child. Like most children at Vernon Elementary, Dulce is able to attend the small Los Angeles Unified District school on permit because her mother works in the city. 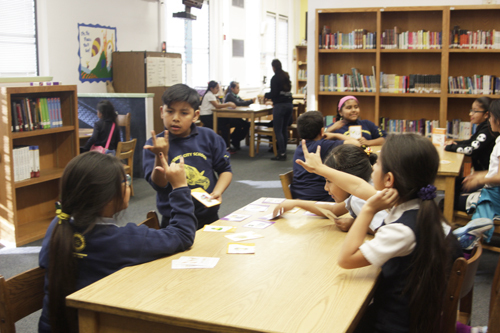 Students travel to the school from Downey, Lynwood, Huntington Park, Boyle Heights, Bell, Bell Gardens, Montebello, Los Angeles and beyond. “If we didn’t have this program I don’t think we would have that many children enrolled in this school,” said Principal Hernandez, adding that when most parents inquire about the school they want to know if there is after-hours childcare. It also helps that all activities, clubs, fieldtrips, supplies and uniforms are free. Things that children from more affluent backgrounds neighborhoods might take for granted are a very big deal for Woodcraft Rangers participants like Roberto Carlos of Long Beach, who was thrilled the first time he saw his name printed on his basketball jersey. The 11-year old also learned to build and program a small robot during the robotics club, something he says he never thought he would be able to do. Clubs like robotics and gardening are an example of STEM (Science Technology, Engineering and Mathematics) infused into the curriculum of Woodcraft Rangers. In the gardening club, students have grown beans, cilantro, kale, onions, potato, lettuce and corn in the school’s first community garden. They are allowed to take some of the vegetables home. “I can introduce myself” in sign language, said Analy Carrillo proudly, emphasizing the point. The 10-year old said she didn’t know what sign language was before taking the class but she has quickly picked it up and has even performed Christmas carols and participated in a “Frozen” themed recital, all in sign language. “Anything you teach to younger kids they are going to pick up fast, so long as we make it fun,” emphasized American Sign Language instructor Marla Vargas. 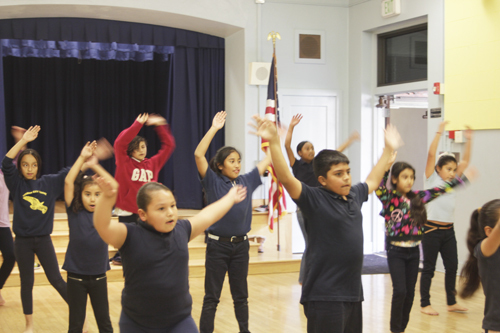 As part of Woodcraft’s dance club, Dulce has learned salsa, cumbia, break-dance and African-inspired routines. The dance team recently won first place in a local dance competition and now the young dancer is considering a career in the arts. “I hope we win again,” she said enthusiastically. “It motivates them and motivates us as parents to work harder,” said her mother, reflecting on the competitions and parades her daughters have been a part of because of the program. Woodcraft Ranger site coordinator Jerry Garcia says the dance recitals, sports tournaments and other presentations have also helped “build a community in Vernon,” bringing residents from all over the region to the resident-poor city. “This is the heart of the community,” he said.